Content Panda for SharePoint has helped more than 500,000 people transform their online user experience. No prior SharePoint experience necessary. Content Panda for SharePoint comes with more than 300 SharePoint training topics, help articles, and videos the moment you install it. No browser add-ons. No pop-ups. No disjointed integrations. No asking end-users to install software they don’t know how to use. Content Panda is managed centrally in SharePoint, requiring no user installation. Easy to install and deploy, Content Panda for SharePoint helps customers realize a return on their investment in less than 3 months. 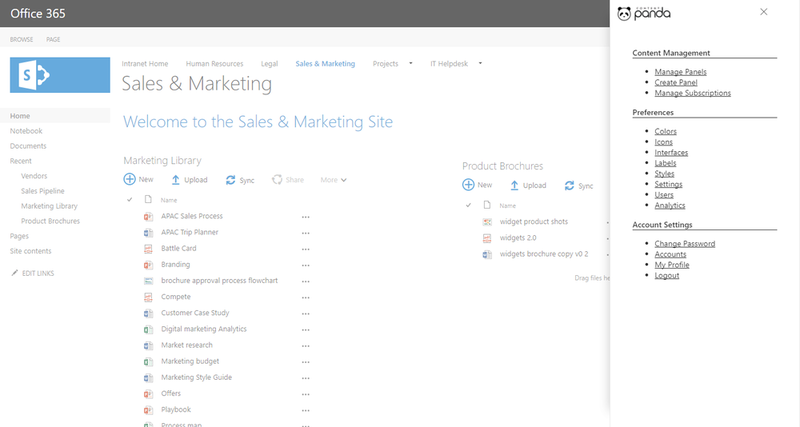 A superior SharePoint user experience starts with great content, right at the moment of need. Leverage Content Panda’s one-stop-shop platform to customize your company’s SharePoint user experience with drag-and-drop ease. Tracks user activity and provides reports that compare your SharePoint usage data with other companies using SharePoint to reach your adoption and support goals. Organizations will also receive personalized recommendations based on their real-time statistics. Insights provided out-of-the-box include vital metrics on SharePoint and Content Panda usage statistics as well as content help. SharePoint Adoption: Percentage of licensed Content Panda users who have visited at least one page on the site in the last 30 days. SharePoint Usage: Average page requests made by users of the site in the last 30 days. SharePoint Coverage: The number of unique pages the average user of the site has visited in the last 30 days. Custom Help Topics: Number of training modules created specifically for your organization's users. Support Activity: Number of help items the average user loads from Content Panda per month. Support Coverage: Percentage of users requesting help as compared to the entire user population. Help Topic Popularity: A graphical representation of the Content Panda training topics accessed by users – including Social, Administration, Content Management, Collaboration, and Custom Company Content. Content Panda supports on-premises, cloud-based, and hybrid SharePoint deployments as well as numerous internet browsers – whether on a desktop, laptop, tablet, or smartphone.